Blade Runner Guest Feature By Matt Cole, Creative Director at Branded Content agency Drum, and founder of Penny Dreadful Menswear. 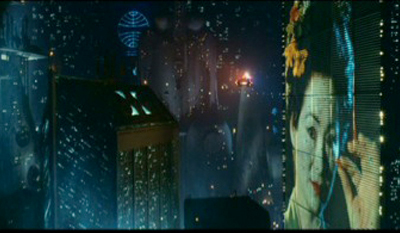 Geisha Girl billboard in Blade Runner. Image © Ladd Company/The Shaw Brothers/Warner Bros.
At ground level “The Egyptian” Abdul Ben Hassan manufactures Snakes, selling them among replicant ostriches and other exotics in the bustling, bazaar like “Animoid Row” while the Mayan styled Pyramidal buildings of the Tyrell Corporation dominate the skyline, monstrous monuments to the gods of Industry. The Tyrell Corporation building in Blade Runner. Image © Ladd Company/The Shaw Brothers/Warner Bros. 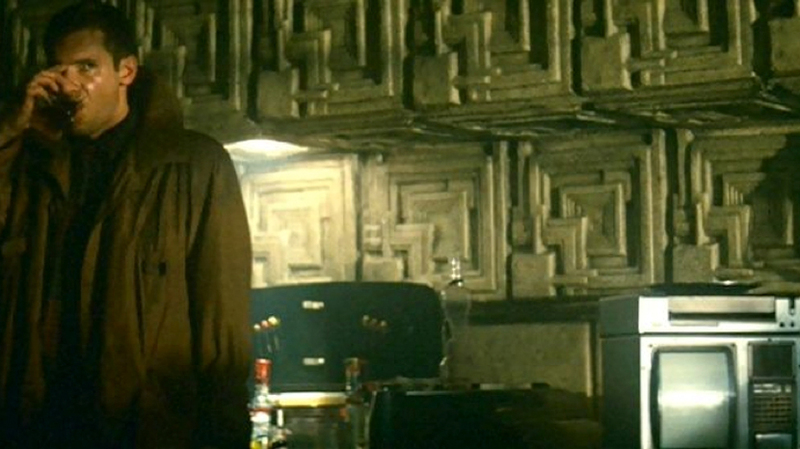 The South American influence continues in the blocky Aztec architecture and interior styling of Rick Deckard’s (Harrison Ford) apartment block. 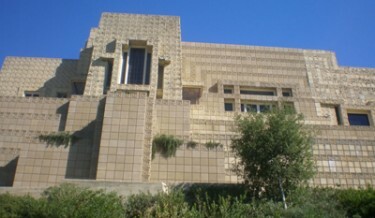 The exterior, shot at Frank Lloyd Wright’s “Ennis House” in the Hollywood Hills, is augmented by one of the many extraordinary matte paintings designed by Syd Mead and completed by Matt Yurichich, Rocco Gioffre, and Michele Moen. Frank Lloyd Wright’s Ennis House. 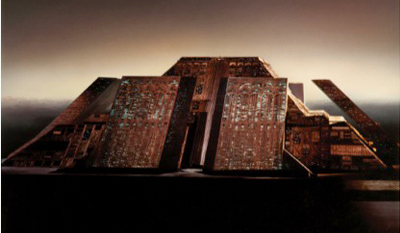 Art director David Snyder took Syd Mead’s original “form meets function” hi-tech interior designs and encased them in custom molded replicas of Frank Lloyd Wrights Aztec building blocks creating a multi-textural man-cave perfectly suited to Deckard’s loner personality. 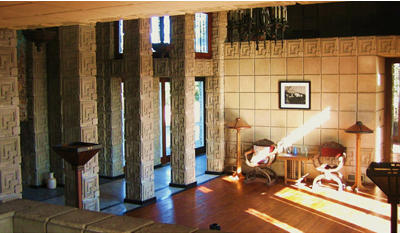 The Ennis-Brown House built by Frank Lloyd Wright was the source for Deckard’s apartment. Syd Mead designed the set interior, and Lawrence Paull took casts of the Ennis-Brown bricks and built the set on stage. 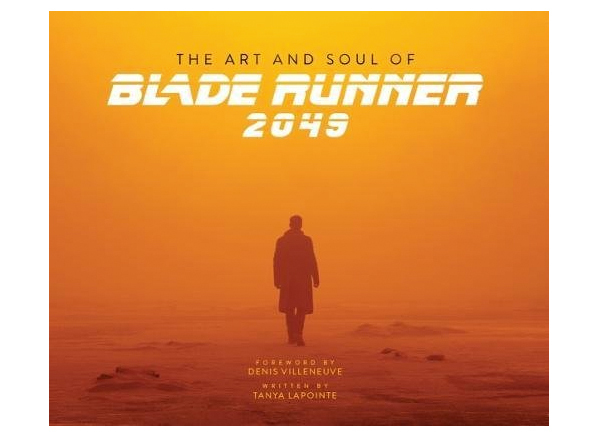 As much as I’m a huge fan of Syd Mead’s industrial sci-fi concept artwork, from Blade Runner to Elysium, it’s the interesting mix of ephemera that Snyder’s team populates Mead’s spaces with that not only authentically depicts the sum contents of a 30 plus divorced male’s life but also injects a sense of personal mystery into an already enigmatic story. 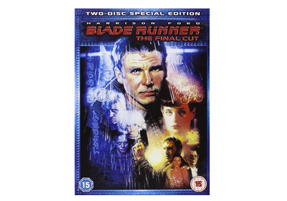 Much has been made of the Art-deco & Art Nouveau influences on the retro-futuristic design of Blade Runner, but it’s true to Ridley Scott’s reputation for perfection in art direction that the vast majority of the early 20th Century pieces in Deckard’s department are genuine. The cost of acquiring Argyle chairs by Charles Rennie MacKintosh and a barely glimpsed Frank Lloyd Wright Coonley Desk probably gave the production manager a small heart attack. Combined with a Panasonic TR-535 pop up TV they build an authentic image of a future heavily influenced by more elegant times long gone. 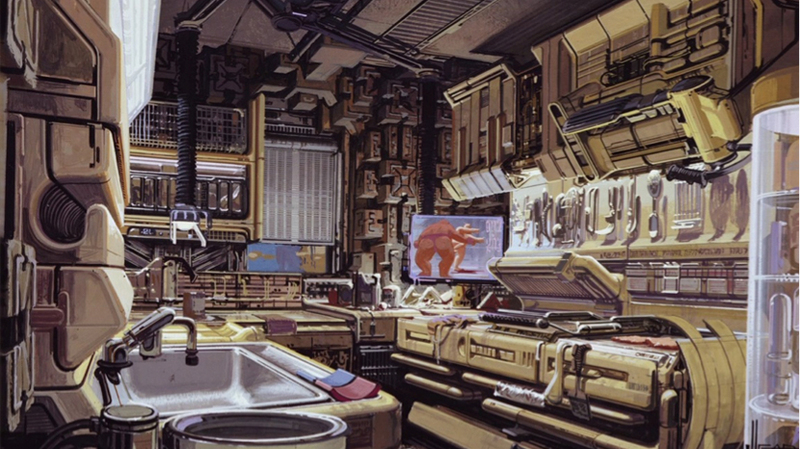 To achieve maximum Future Noir moodiness Deckard’s apartment features little to no overhead lighting. 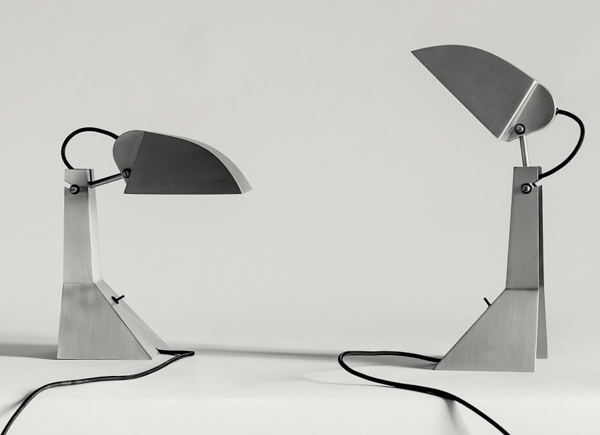 Instead the surfaces are filled with a myriad of lamps including 3 choice American art-deco examples – a 1940’s Lightolier desk lamp by Gerald Thurston (want! 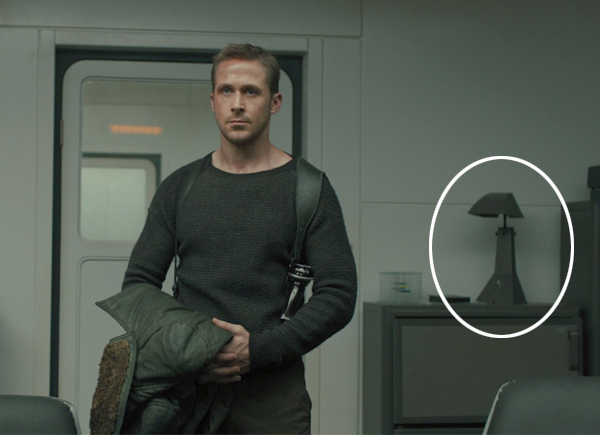 ), a strangely kitsch World’s Trade Fair lamp and hovering over the piano where Deckard has his Unicorn reverie is a Dazor Saucer Lamp. 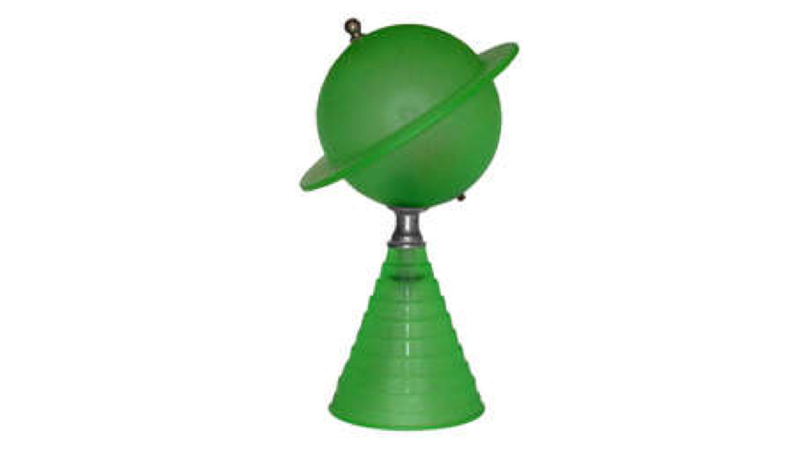 A World’s Trade Fair lamp. In an age before 3D printing even the future was cobbled together from the present, including the image scanning ESPER Machine, in reality a portable TV with a couple of alarm clocks and what seems to be a Polaroid camera stuck to the side. As a young viewer it was still the coolest piece of tech, lent realism because it seemed second-hand and slightly knackered, screen etched with pen marks. Elsewhere the past continues to collide with the contemporary in building a convincing future. The story goes that Scott himself found 2019’s answer to the Lazyboy, a huge leather suite with built-in lighting, in a junk sale having recently been removed from an LA Nightclub that had fallen on hard times. 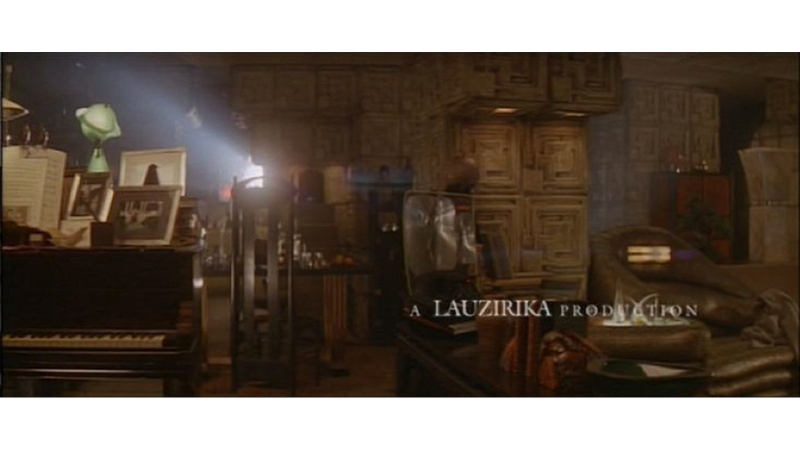 Amongst this wealth of amazing stuff expertly and painstakingly thrown together to create the perfect mess of a dysfunctional bachelor pad there are 2 items I’ve come to covet most over my 50 or so viewings of Blade Runner. 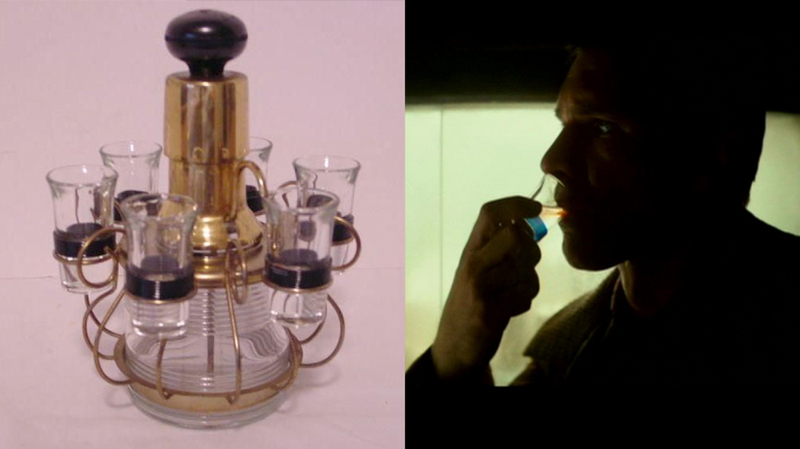 Both of which are the vessels that transport the fuel of Deckard’s burgeoning alcoholism. 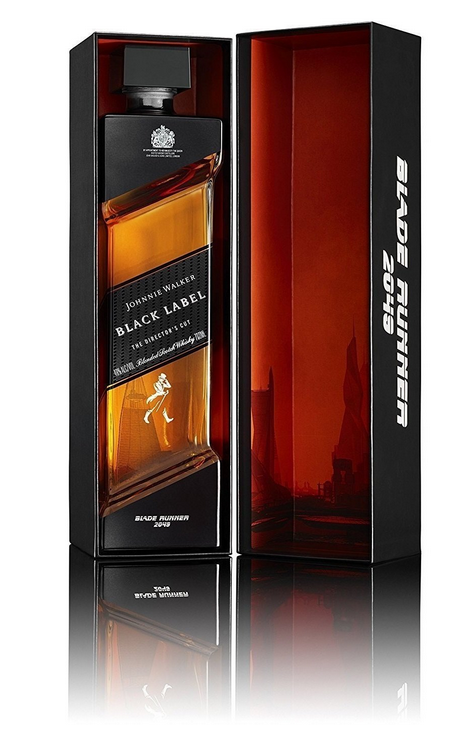 The shot glass tainted with blood after Deckard’s violent run in with Leon originally formed part of an elaborate set by the wonderfully named United Metal Goods from the 50’s. In my favourite shot from the film, standing on the apartment balcony, hundreds of stories above the city Rick reflects on cruelly bursting Rachel’s faux-human bubble. 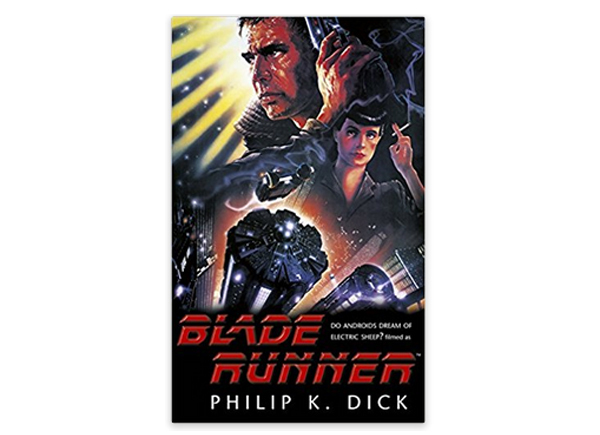 For one fleeting moment Deckard leans over as if he might jump. The glass in his hand is a 1974 Arnolfo di Cambio CIBI tumbler. Look at it glowering in that promo image. 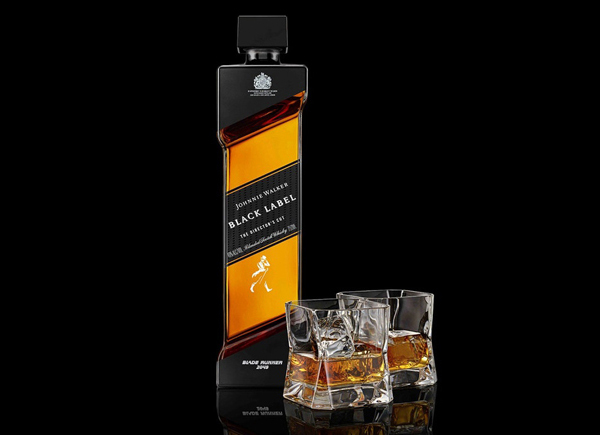 That’s a serious Whiskey glass surely built with Future-Noir, Replicant Hunting, Killer Cops in mind. 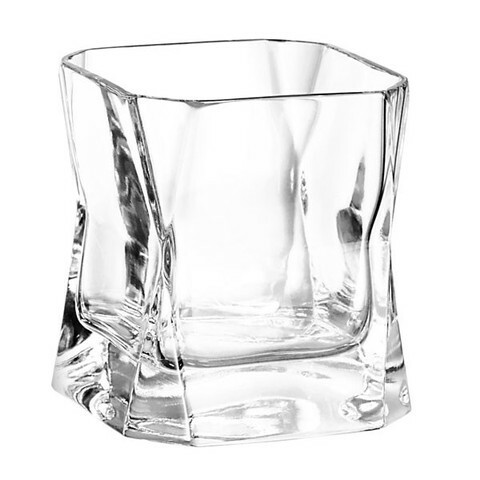 The shot glass tainted with blood after Deckard’s violent run in with Leon originally formed part of an elaborate set by United Metal Goods from the 50’s. It’s more than likely that Snyder and his team had a very tight brief from Ridley Scott according to his overall vision for the style and texture of LA 2019 and all these disparate items came together like a jigsaw puzzle, piece by piece to create a cohesive whole that looked great on camera. But I have a theory. Bear with me. 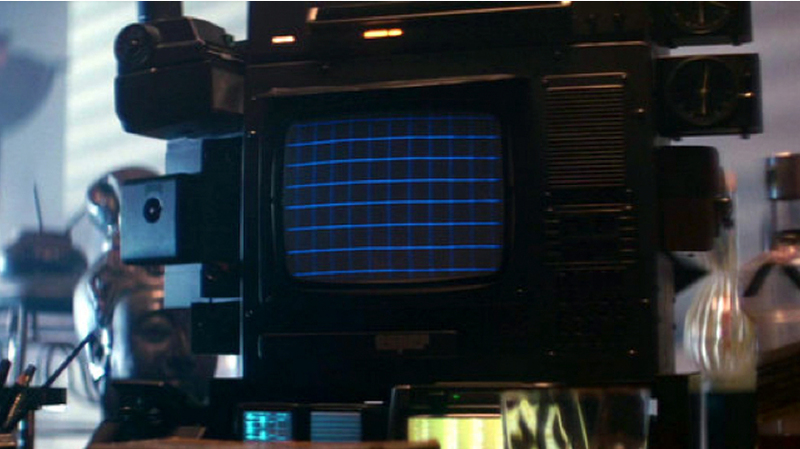 Deckard’s apartment is crammed full of not just a selection of choice furniture, elegant lamps and shonky old portable TV’s. 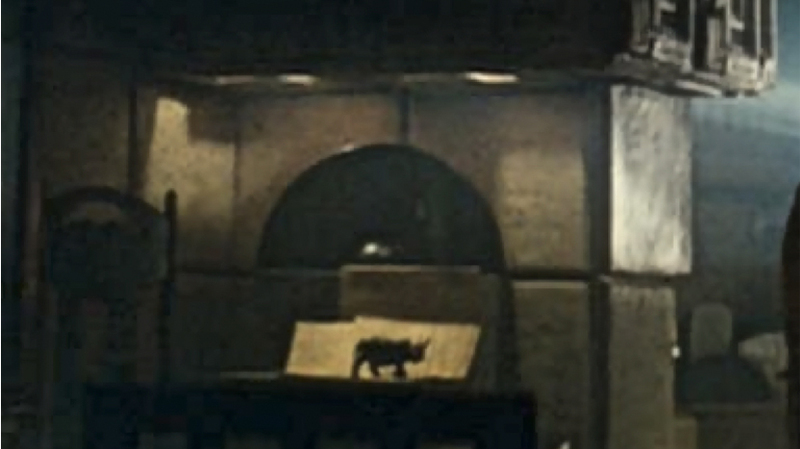 Rick’s also got a fair few knick-knacks like this carved wooden rhino. Rick’s also got a fair few knick-knacks like this carved wooden rhino. 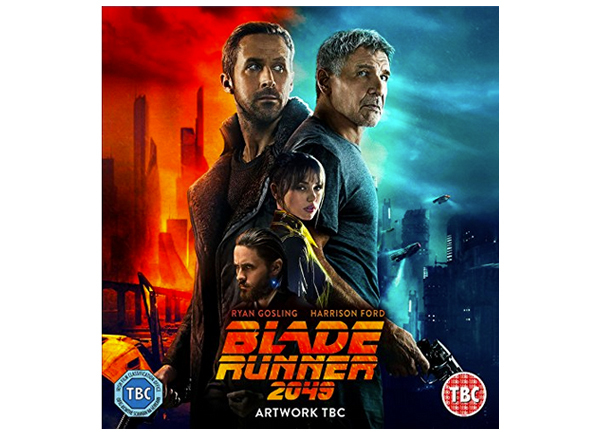 Now does “One man slaughterhouse” Blade Runner Rick Deckard strike you as the kind of guy who’d spend his weekends browsing through antique fairs and car boot sales looking for wooden Rhinos and art deco dining chairs? Well maybe. 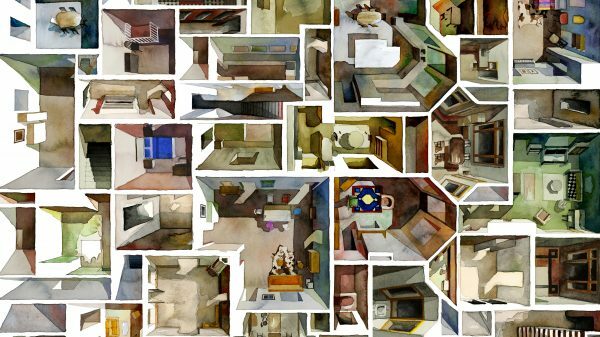 Replicants are collectors, empty vessels constantly trying to build an identity. Leon compiles memories in a literal way with his “precious photos”. 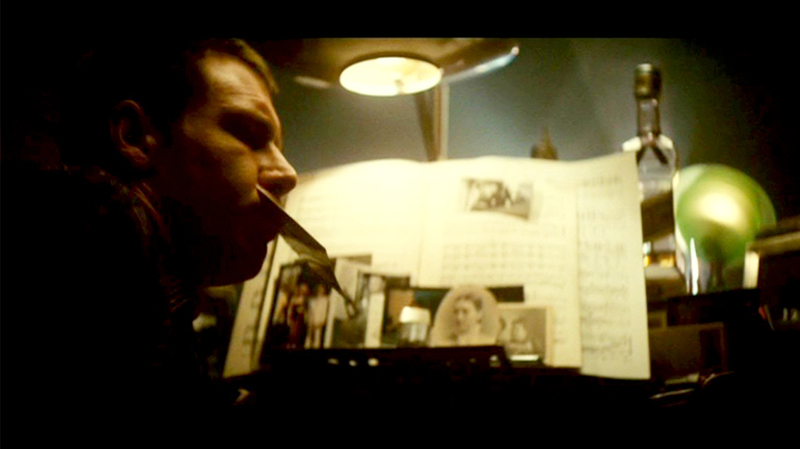 Rachel also carries a photo of “her mother” as proof that she had one and Deckard’s piano is loaded with seemingly random snaps, some incongruously black and white next to holographic prints. 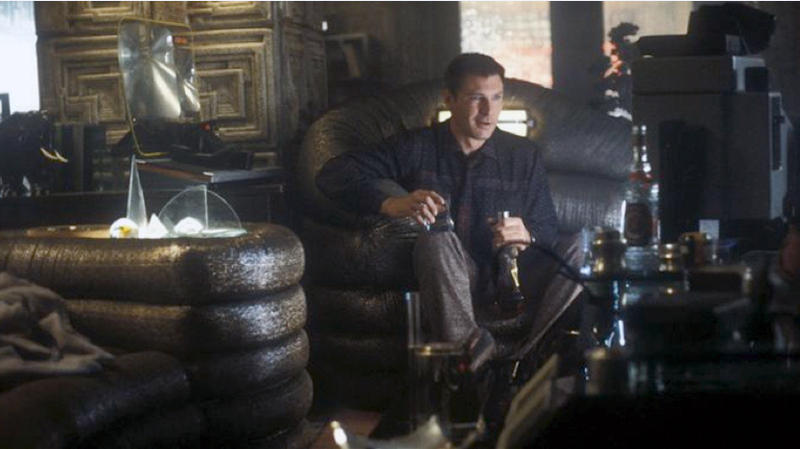 Perhaps despite being oblivious to his Replicant origin Deckard is filling his home with items harboring their own pasts and stories in a subconscious attempt to fabricate a soul? Or maybe he just rents the pad fully-furnished. Who knows. 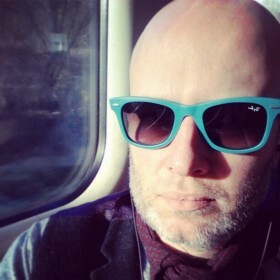 Matt is Creative Director at Branded Content agency Drum, founder of Penny Dreadful Menswear and a card carrying geek. What’s the low down and where can I get one? Probably the coolest tumbler ever made, the 1974 Arnolfo di Cambio CIBI tumbler is a ‘Double Old fashion glass’ made from hand blown crystal glass, It is very much still in production by The Arnolfo di Cambio company which was founded in Tuscany, Italy in 1963 and in the course of 45 years and three generations has become one of Italy’s leading glass manufacturers. 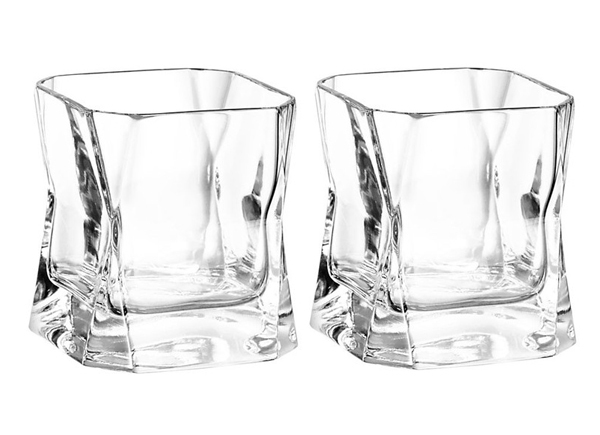 Hard to Find Whisky sell Arnolfo di Cambio tumblers – A twin pack is around £99.99 and they offer world wide delivery. 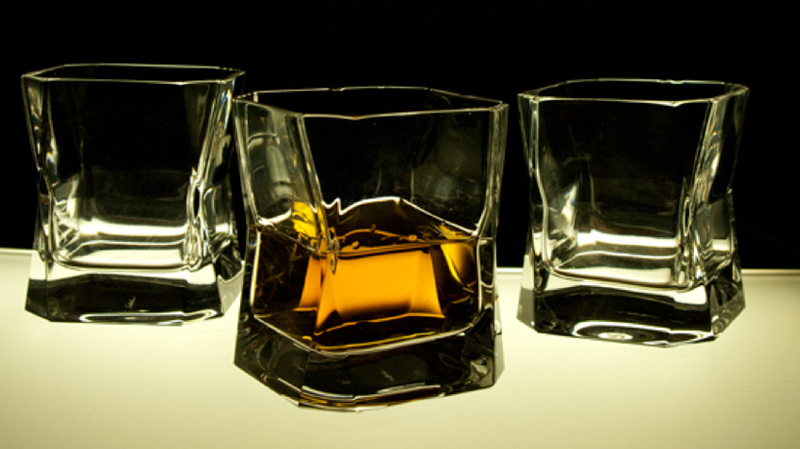 Tried and tested by Film and Furniture these glasses are the ultimate gift for a whisky drinking Blade Runner fan. Frank Lloyd Wright Coonley Desk. Mackintosh originally designed these high-backed chairs for the Argyle Street tearooms in Glasgow in 1897, hence their name and why you would be more likely to find an original on the open market since they were made in multiples for the tearooms. 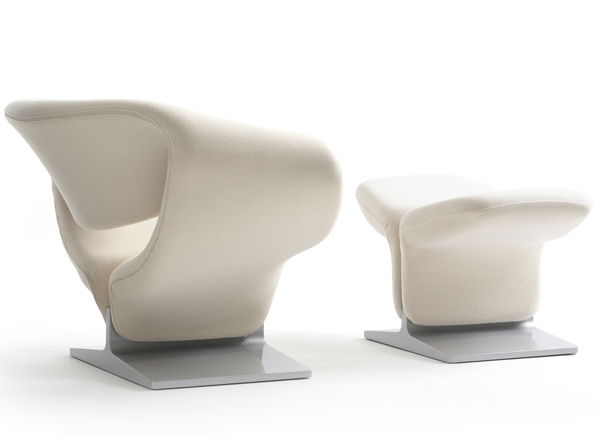 Cassina currently sell new versions produced under license from the Estate of Charles Rennie Mackintosh (so indicated by a stamped signature and serial number of each model.) The pierced oval back-rail is decorated with the familiar flying bird motif used elsewhere at the Argyle Street Tea Rooms. The Cassina Argyle chair has an ashwood frame stained black and a seat upholstered in a choice of colours from the Nebraska collection. 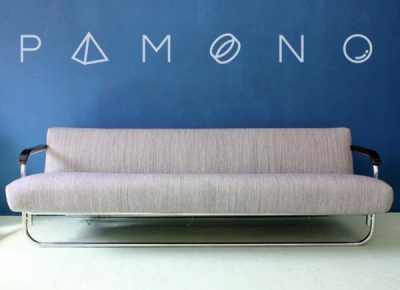 Priced £1818 from Atomic Interiors. 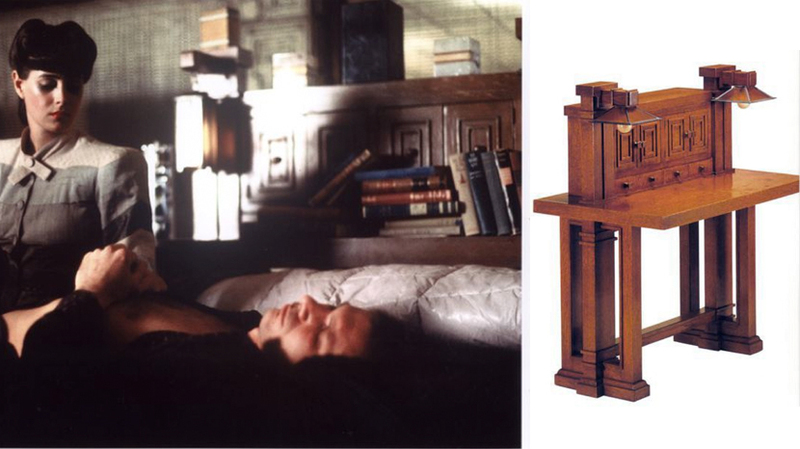 Scottish based Bruce Hamilton Furniture Makers also producers quality Charles Rennie Mackintosh reproduction furniture. Bruce has undertaken many Mackintosh commissions, both for private clients and commercial outlets and has acknowledgements from both the Glasgow School of Art (GSA) and the Charles Rennie Mackintosh Society which is based at the Queen’s Cross Church in Glasgow. 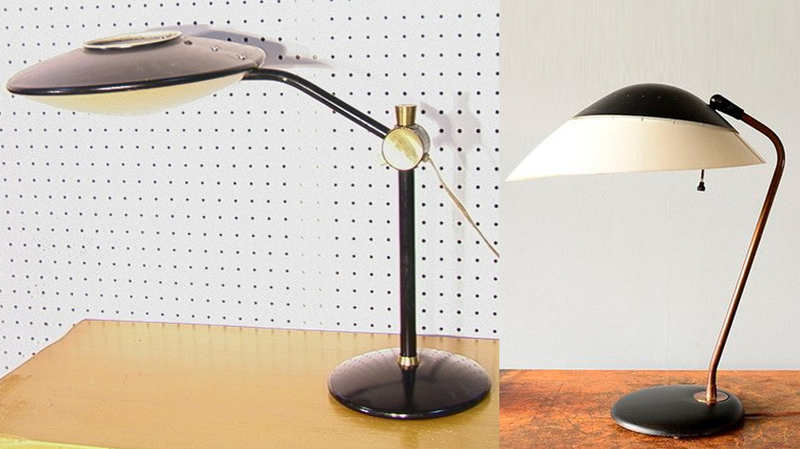 The Lightolier desk lamp by Gerald Thurston features a matte black metal base, angular brass-plated arm, and white plastic shade with a matte black metal crown. The hinge allows the shade to be moved up/down and left/right, positioned as you wish. Red Line Vintage sold one recently and might be able to find you another if you get in touch and they have also been sold by 1stdibs, Ebay and Etsy vintage. 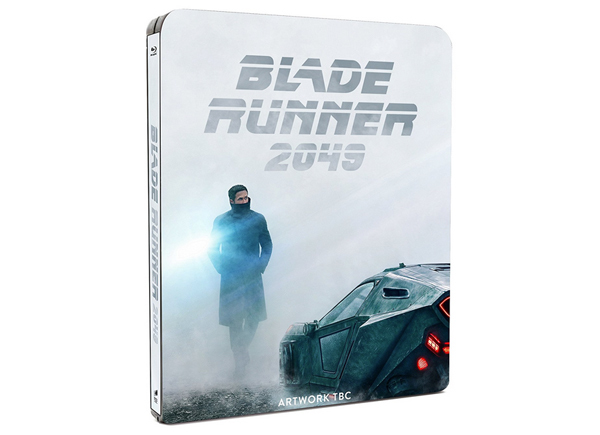 The Blade Runner 2049 journey is chronicled with captivating detail in this official visual guide presented in an oversized, luxe, full-colour format. The author documented the film’s production for two years, gaining unprecedented access to the creative process of bringing this epic to life. 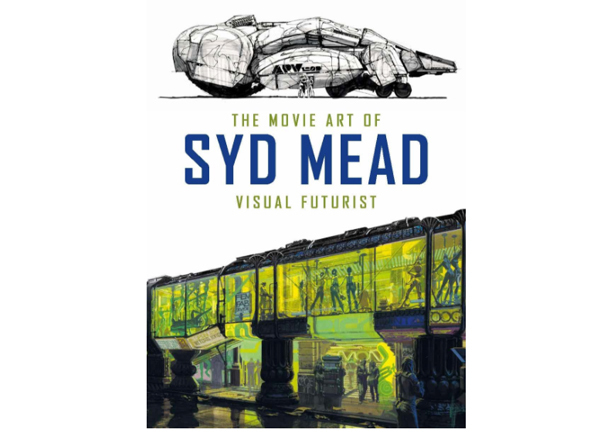 An extensive collection of Mead’s visionary film work including ALIENS, Blade Runner, Star Trek The Motion Picture, and Elysium, compiling hundreds of images, sketches and concept arts from a career spanning almost 40 years, many of which have never been seen in print before. What an informative article. So well researched Matt. 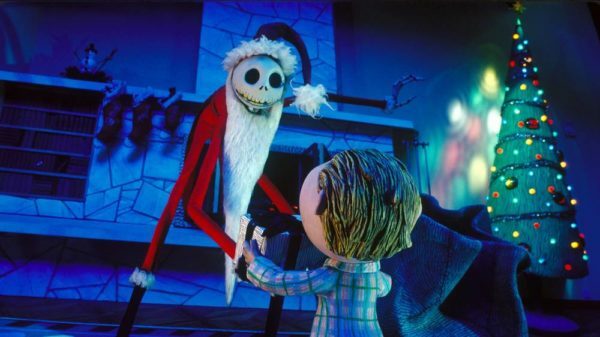 As a post-script – also interesting point on the low level lighting to create a sense of cosy-unease. Those Argyle chairs are quite enigmatic. They look like they are too low but it’s probably due to the really high backs. Sean Young is no midget and she doesn’t look awkward on one. 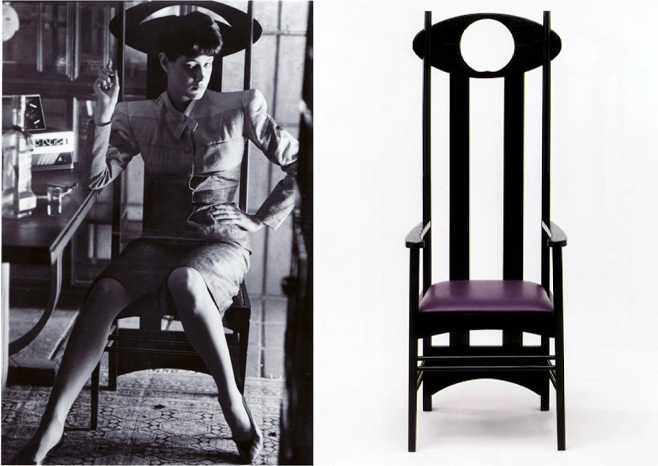 Very interesting article.I saw Bladerunner on BBC TV a couple of weeks ago and spotted the Charles Rennie Mackintosh chair. Like it so much I decided to make one (I enjoy woodwork as a hobby). I was able to find a book with the chair featured in a photo but could not find a measured drawing so had to guess the size. Quite pleased with the result. John, I’m intrigued and impressed by your “I want that chair, I shall make that chair” attitude, would you care to share a picture of the finished result? Trying to figure out how to put this article on my BladeZone facebook page may I?? 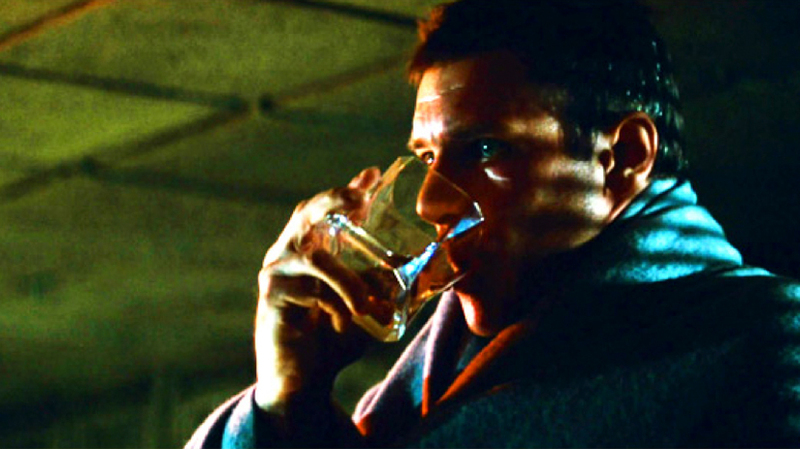 Bladerunner is probably artistically one of my favorite movies. I have the original “shaver” prop from the bathroom scene that one of the props guys gave me. It’s actually a sphere shaped lighter. A rare gift indeed. 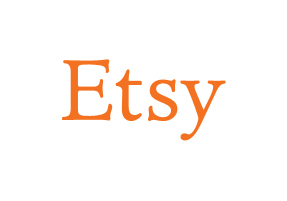 Don’t forget eBay for a treasure trove of vintage and preloved items. We have frequently found real gems and vintage items seen in films.